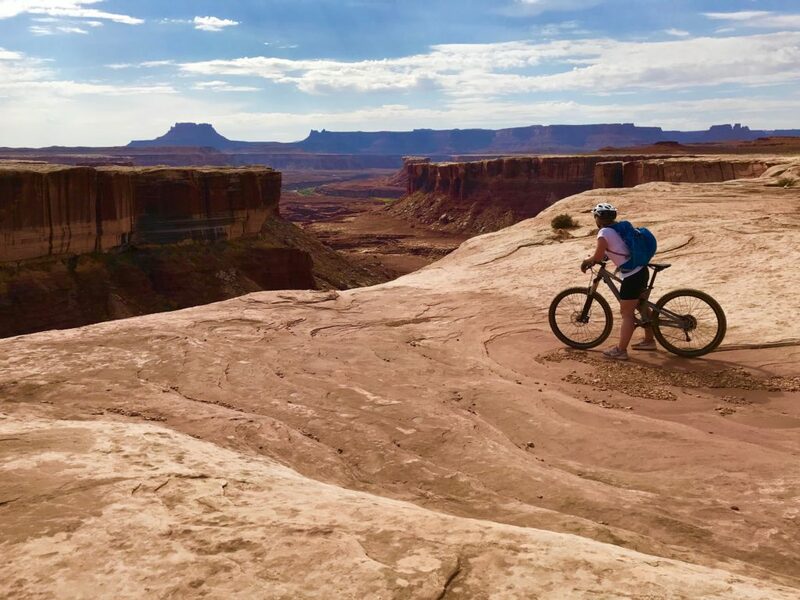 Mountain Biking the White Rim Trail: Forget what you think you know about a multi- day mountain bike trip through some of the most rugged terrain in the world. You can do this. In fact, you just might love every minute of it. 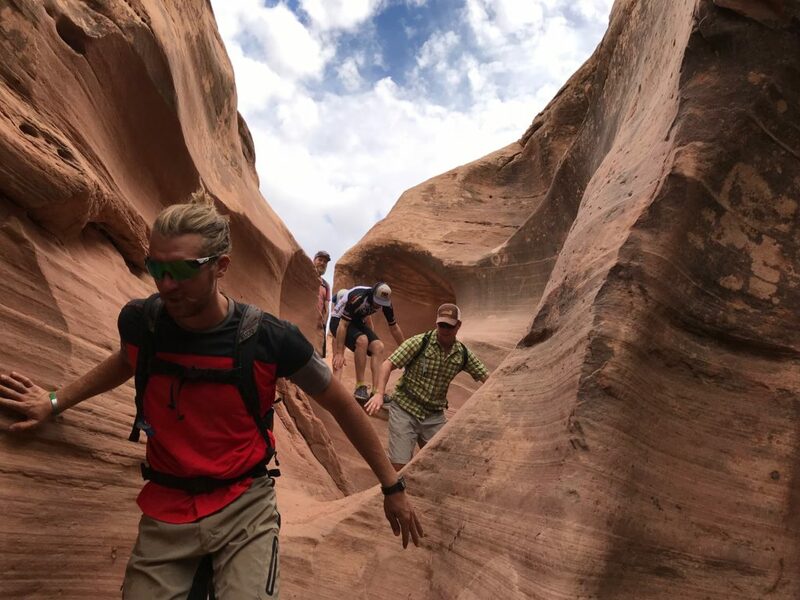 When we arrived at Western Spirit Cycling Adventures in Moab, Utah for a three-night, four-day 80-plus-mile tour of the world famous White Rim Trail, named for a white capped bench that sits in the Island in the Sky in the Canyonlands National Park, we didn’t know what to expect. Getting our fair share of exposure to extreme skiers and snowboarders, climbers and ultra-athletes, we noticed right way we weren’t heading out with a crew of rowdy, extreme athletes and adrenaline junkies. Who we found was a spirited group ranging in age and ability, all simply looking for a new adventure. Retired teachers. Young parents. A speech therapist turned librarian. Surgeons. Finance professionals. Two sisters from Boston had never camped, much less mountain biked 80 miles through the desert. They came on a tip from a friend who promised they would love it. 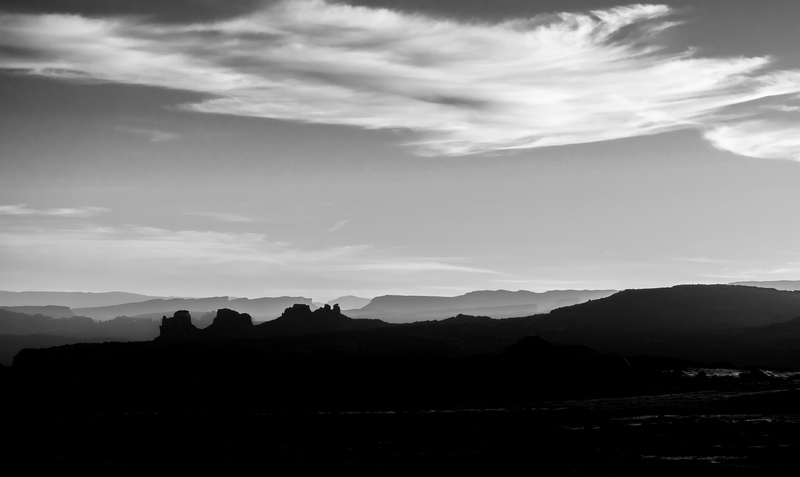 Wanting a new kind of journey, that’s what the White Rim gave them. It’s a journey of the self, with others through a wild and endless landscape that is, in every way, different than anything we call normal. Canyonlands National Park in Southeastern Utah is 358,000 acres of some of the most uniquely remote and stunning desert environment in the world. It’s divided into three main sections, or districts; The Island in the Sky; The Needles and The Maze. Canyonlands is home to a landscape of sandstone canyons, mesas, arches, soaring towers, and delicate ecosystems. The Green and Colorado Rivers flow and actually converge here and populations of diverse wildlife: mountain lion, elk, birds like canyon wrens and flycatchers, rattlesnakes, scorpions, otter, mule deer, ring-tailed cats, owls, bobcats, kangaroo rats, and an amazingly immense cross section of other birds and reptiles and insects have made this place home unlike anywhere else on earth. Cowboy, pioneer and even ancient cultural history is also prevalent in the park, much of which is easily visible to visitors. Rock art adorns lonely walls. Cliff dweelings still stand hidden in acloves. Trunks from settlers more than century old sit in the dust beside the banks of the Green River. 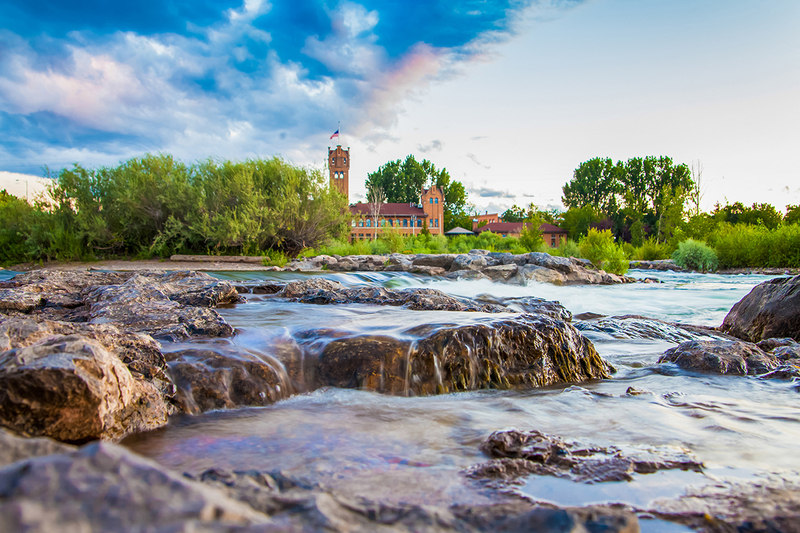 Considering the rugged nature of the park, it’s no wonder people flock here for adventure. 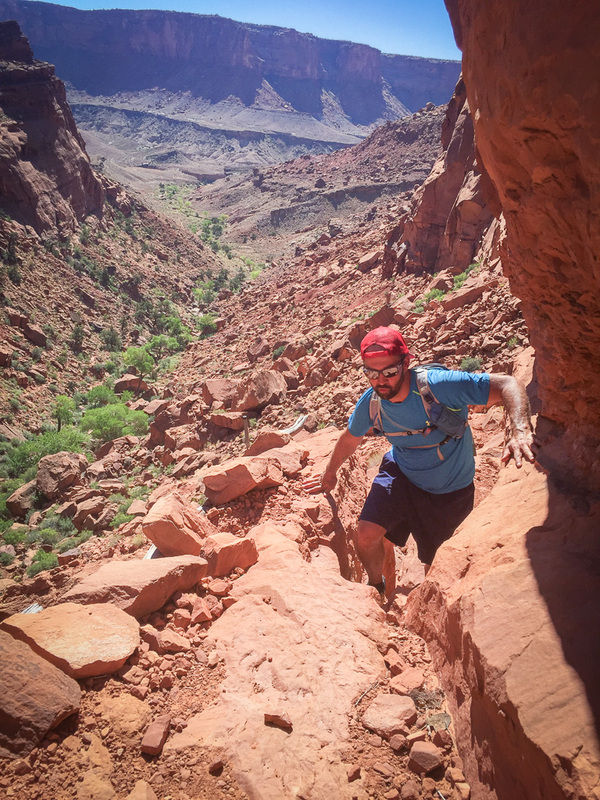 The White Rim drops in to and climbs out of a river canyon at each end and connects the two by an undulating unmaintained course that meanders across the vast desert physiograophy. 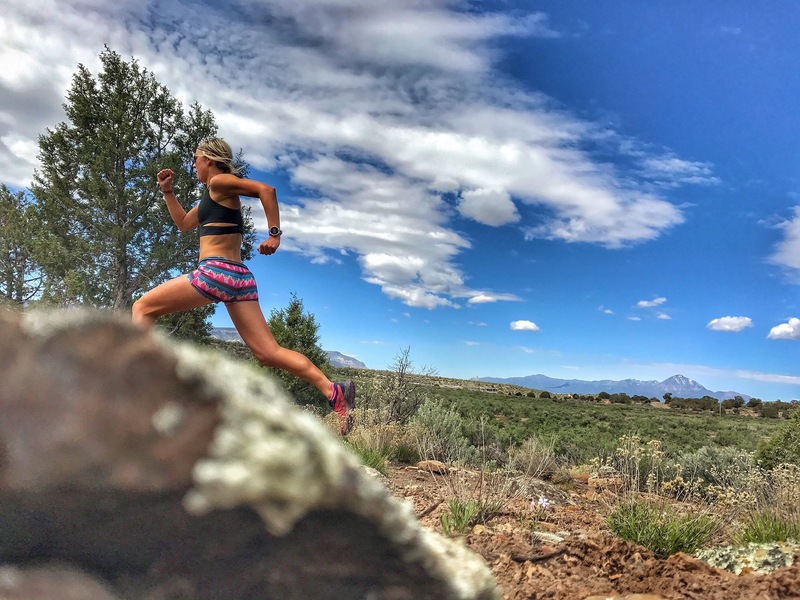 There are hills, there are flat stretches. There’s wind. There’s sun. There is weather. It’s all part of the beauty. We learned first hand where the camp at Airport Tower gets its name. The ravens, who master the gusting winds, took flight with no effort whatsoever. They also unzipped backpacks and flew off with snack bars and headlamps. And with the support of an outfitter like Western Spirit, it’s even better. For a haphazard group of mountain bikers, it’s all a dreamscape. Rolling terrain, expansive views. and all the food you could eat. At every meal a long table appeared. Then it began. Lunches with pickles and chips and homemade trailside guacamole. Then came the salad and hearty sandwiches. Diner might be lasagna with garlic bread, New Mexican green chile enchiladas with local elk and sweet potatoes. One night was someone’s birthday. The cupcakes were heavenly. Someone ate three. With side hikes and regular stops to take it all in, riders were able to go at their own pace. To stop for photos. Stop for the stillness. Stop for themselves. At every horizon was another vista. 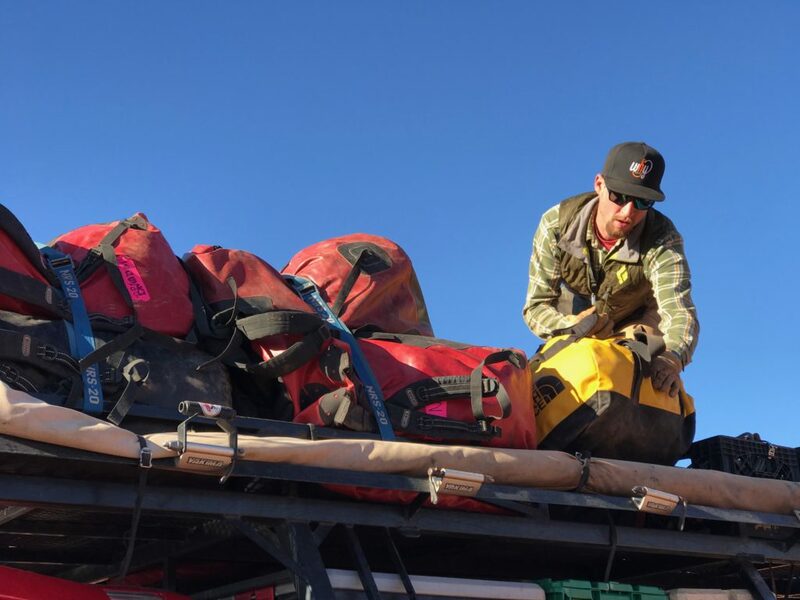 What we all found was a captivating beauty, rewarding challenges and a way to share it with a crew of adventure hungry folks from all over, some who have never even ridden a mountain bike or slept in a tent. It didn’t matter. What mattered was they were there.